A new e-book by literature professor Micah Perks is one of 12 titles featured on Shebooks—a just launched startup that publishes short pieces designed to bridge the gap between magazines and books, with carefully curated high quality fiction, memoir, and journalism tailored to women’s interests. 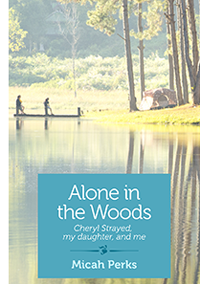 Perks’s memoir, Alone in the Woods: Cheryl Strayed, My Daughter, and Me, is a perceptive exploration of women and the wild—examining the wildness Perks experienced as a child on a commune, the different ways women and wildness are portrayed in the media, as well as the wilderness she finds out is inside her own daughter. 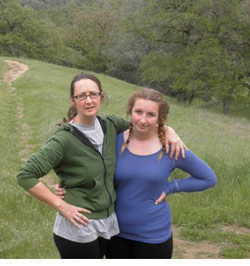 “It's a short memoir about women in the wilderness, about fear and bravery, about what we teach our daughters about wildness,” Perks noted. 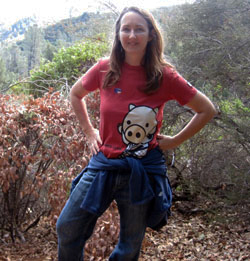 Perks said the book was inspired by her longstanding interest in ideas of wildness and wilderness in the United States, ideas that she has focused on in previous works. Perks’s volume on Shebooks stands alongside memoirs and fiction by other established authors and essayists, including Hope Edelman, Marion Winik, Faith Adiele, and Suzanne Paola. Now available for Kindle and Nook devices, the growing selection of e-books will be available by subscription through the Shebooks.net web site beginning in March. Shebooks is co-founded by Laura Fraser, a journalist and best-selling author (An Italian Affair); magazine editor Peggy Northrop (Reader’s Digest, Vogue, Sunset), and publishing veteran Rachel Greenfield (Martha Stewart Living Omnimedia). Perks said that Shebooks came about after an organization of women writers (VIDA: Women in Literary Arts) began publishing an annual "count" three years ago, in which they produced pie charts showing the number of writers published in print venues broken down by gender. “Shebooks publishes long-form journalism and short stories—pieces between 30 to 40 pages,” Perks added. “The size makes sense for people who don't have a lot of time, but who want to read something more in depth than an article. They're also inexpensive at $2.99 apiece, and they can be downloaded on any device, even a phone. Perks is also the author of a novel, We Are Gathered Here, and a memoir, Pagan Time, about growing up on a commune in the Adirondack wilderness. Pagan Time is now an audiobook from Audible, as well as an ebook, and has been translated into Korean. Her short stories and essays have appeared in such journals and anthologies as Epoch, Zyzzyva, Tin House, and The Rumpus. The recipient of an NEA Award and four Pushcart Prize nominations, Perks is also co-director of the UC Santa Cruz Creative Writing Program.